A number of years ago, the Lord had led me, through one of our very gracious parishioners, to work with a company, where we developed and mass-produced microscopic circuits, on very thin plastic sheets, that were used to make tiny hearing aids. We were, in essence, technologically, healing the deaf. Today, between our use of amplified sound systems, hearing aids and vocal amplifiers for the speech-impaired, at least in our prosperous country, we don’t really have a huge number of destitute, deaf and mute people any more. Yet, 2000-years ago, and even today in the less prosperous nations of the world, people who were deaf or mute, or blind or lame, were considered outcasts in their communities. And they were totally dependent on others for support; and really, for their very lives. This is the setting, in which we find Jesus today. 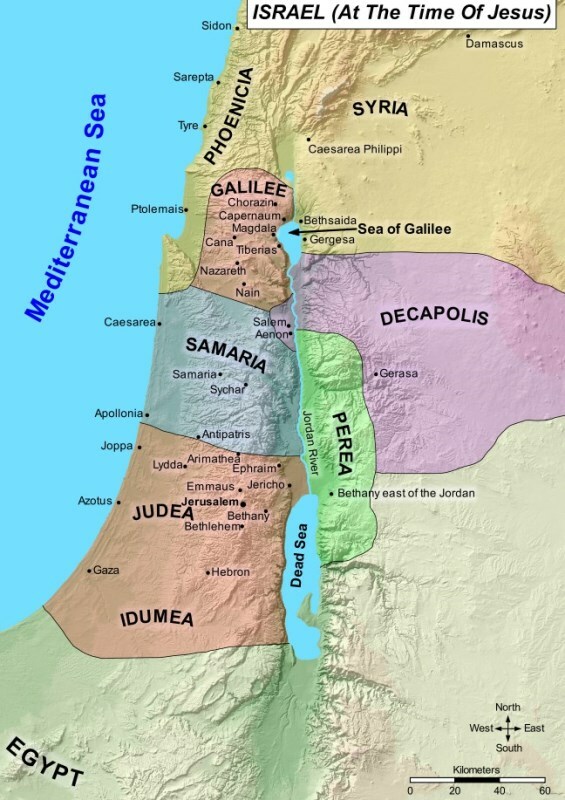 To begin with, the area called “the Decapolis” or the ’10-Cities,’ on the eastern side of the Jordan River, where Jesus and His disciples were traveling, was mostly populated by Greek people, and not Jews. And of course we remember that the Jews and the Gentiles didn’t always get along very well together. So it was more-likely that the Greeks were looking for some “showy entertainment,” rather than the intervention of God for healing. Yet, they did love the deaf man enough, to give Jesus a try. And so they pleaded for his help. It was a beautiful example of what we, today, call intercessory prayer, where we pray for God’s healing of OUR loved ones, and for our world. Now the deaf man, himself, was probably embarrassed with all the commotion surrounding him. And he probably didn’t have a clue as to what was going on. So Jesus, rather than fuel the superstitions of the natives; and with great compassion for the feelings of the deaf man, took him off, by himself, away from the crowd, in private. It was not to be a showy entertainment, even though, from the looks of what Jesus did, we might have thought otherwise. But, think about it. How would WE communicate with someone who could not hear, or speak, or even read? And even if they could read, their language would have been different than ours. Of course, if you’re a parent, or a big brother or sister, you probably have this all figured out already, in having to communicate with your babies. You know, that you have to use a language that THEY can understand! You see, the deaf man couldn’t hear, but he could feel, so Jesus touched his ears. The man couldn’t speak, but he knew that spittle signified the expulsion of evil, so Jesus touched his tongue with spittle. And then, rather than taking all the credit for the miracle, Himself, which Jesus had a perfect right to do, He looked UP to His Father in heaven and groaned. How does a mute person speak? – In groans. And the groan was then converted into a Word: Ephphatha, Be Opened. And so it was said, and so it was done! All to the Glory of God! And a gaggle of Greeks became believers in the process! But it wasn’t quite the end for Mark nor for us. You see, Mark knew that the story would not just be heard or read by the Greeks. Jesus had disciples to teach, and these people were Jewish. And He knew that the story would reach out, even as far as Jerusalem, to the Jewish religious leaders. So there had to be a deeper meaning for the Jews, and . . . IT had to be told, in a language that THEY would understand, as well. And what was the language of the Jews? Today we call it the Old Testament. And the Old Testament tells the story of a God who loved His children, His Creation, SO much, that He promised to intervene in healing their blind and their lame, their deaf and their mute. He promised that He would nourish those who were hungry, and bring HOPE to the poor, the oppressed, the widow and the orphan. In short, the Words and actions of Jesus, precisely fulfilled the Old Testament prophesies of Isaiah about the healing intervention of God. And Mark made this unquestionably evident in the Gospel passage that we heard today by using the exact same Greek word to describe the man’s speech impediment, that was used in the Book of the Prophet Isaiah. These were the ONLY two times that particular Greek word, mogilalon, was used in the entire Bible. So for the Jews, Mark is saying, in their own language, that Jesus IS their promised Messiah. How does this story relate to us? This Ephphatha Prayer, straight from Mark 7, reminds us to always BE OPEN to God’s Word. It reminds us to Be Open to hear God’s directions for our lives. And it reminds us to Be Open to God’s presence in other people, without judgment and without prejudice. And in our openness we will grow in our Faith and our understanding of God’s Love. Then, strengthened in our Faith, we will take that Good News of God’s Love for us, and offer it to every other person we meet. Of course, in the process, we also remember that THEY will only hear us, IF we communicate with them in a language that THEY can understand. Have you noticed how the news media, and thus, the world, has taken such a keen interest in what our Pope has to say? As Catholics, do you think that Pope Francis is really proclaiming a whole lot of anything that’s NEW? He really isn’t . . . But, what He IS saying is said in a language that the world can understand. And isn’t it beautiful to see a listening world! Even if they, or we, don’t always get it perfectly right! Jesus is asking us to follow Him on His way, and that takes being open. It may not lead us to the amusement park or to the ball game. It may even lead us to foreign places, where the people speak totally different languages. Thus says the LORD: Say to those whose hearts are frightened: Be strong, fear not! Here is your God, he comes with vindication; with divine recompense he comes to save you. Then will the eyes of the blind be opened, the ears of the deaf be cleared; then will the lame leap like a stag, then the tongue of the mute will sing. Streams will burst forth in the desert, and rivers in the steppe. The burning sands will become pools, and the thirsty ground, springs of water. The God of Jacob keeps faith forever, secures justice for the oppressed, gives food to the hungry. The LORD sets captives free. The LORD gives sight to the blind; the LORD raises up those who were bowed down. The LORD loves the just; the LORD protects strangers. The fatherless and the widow the LORD sustains, but the way of the wicked he thwarts. The LORD shall reign forever; your God, O Zion, through all generations. Alleluia. My brothers and sisters, show no partiality as you adhere to the faith in our glorious Lord Jesus Christ. For if a man with gold rings and fine clothes comes into your assembly, and a poor person in shabby clothes also comes in, and you pay attention to the one wearing the fine clothes and say, “Sit here, please, ” while you say to the poor one, “Stand there, ” or “Sit at my feet, ” have you not made distinctions among yourselves and become judges with evil designs? Listen, my beloved brothers and sisters. Did not God choose those who are poor in the world to be rich in faith and heirs of the kingdom that he promised to those who love him? Again Jesus left the district of Tyre and went by way of Sidon to the Sea of Galilee, into the district of the Decapolis. And people brought to him a deaf man who had a speech impediment and begged him to lay his hand on him. He took him off by himself away from the crowd. He put his finger into the man’s ears and, spitting, touched his tongue; then he looked up to heaven and groaned, and said to him, “Ephphatha!”— that is, “Be opened!” And immediately the man’s ears were opened, his speech impediment was removed, and he spoke plainly.